Guns N’ Roses guitarist Ron “Bumblefoot” Thal has partnered with Gibson and the Little Kids Rock music program. On Wednesday, May 1, Thal will jam with students at Mott Hall Community School in the Bronx as part of the program; in addition, he will be arriving with free guitars for the students, courtesy of Gibson. The guitars are part of a donation of over $75,000 worth of electric guitars that Gibson made to the national non-profit organization Little Kids Rock and distributed to schools affected by Hurricane Sandy throughout Manhattan, the Bronx, Brooklyn, Newark and Jersey City communities. Little Kids Rock, the United States' leading nonprofit provider of music education and free instruments to public school children, is currently reaching over 109,000 children with weekly music lessons amidst budget cuts that are eliminating music education from some of the nation's most disadvantaged public schools. More than 24,000 current Little Kids Rock students are being taught in 240+ New York/New Jersey schools in communities that have been affected by Hurricane Sandy. 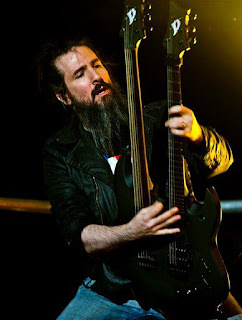 Bumblefoot and Gibson have partnered with Little Kids Rock in this initiative to help ensure that these classrooms do not remain silent due to the damages of the hurricane this past fall. Bumblefoot will help deliver some of these guitars to a Little Kids Rock class at Mott Hall Community School in the Bronx where he will engage in a question-and-answer session, as well as a jam session with the students. "Little Kids Rock is so grateful to Gibson for their generous donation to our children, and to Bumblefoot for helping us inspire children and transform their lives by giving the gift of music," says Little Kids Rock executive director and founder David Wish. "Music changes children, and children change the world." Learn more about Little Kids Rock here.